Russia's officials should draw a lesson from SLBM Bulava test failures. The subsequent failed test launch of new SLBM Bulava caused a feeling of pique but not surprised. Regrettably, we have nothing else to do but to recognize it. The problems related to creation of new ballistic missile system for SNF naval component are direct consequences of systematic crisis of 90-ies. Chapter of failures happened to Bulava tests demonstrate that destructive aftereffects of 90-ies have not been eliminated so far. Aside from those who directly engaged in test procedures of R-30 system, residents of Norwegian town Tromso watching a strange airglow early morning of Dec 9 were the first to know about unsuccessful launch. Images of that "phenomenon" were instantly posted on the Internet; right after that started a stormy discussion of event unusual for the hick town. Though, the gossip went beyond Norway very fast. Traditionally, first comments of the Norwegians were that UFO had appeared above the town; however, the most watchful spectators immediately scented that was Russian missile. But as to Russia, nobody doubted that miraculous effulgence over Tromso meant next test failure of Bulava. Indeed, on Dec 10 it was officially promulgated that subsequent test launch of R-30 missile had been failed. Those events again proved the fact that at modern level of development and informatization one or another top secret fact seems to come into the public domain long before official release. For the first time, that was seen on a considerable scale during 5-day conflict with Georgia which has become "the first blog war" for Russia. We'll return, however, to Bulava. As it was reported in official press release of defense ministry, this time malfunction happened to the missile's third stage. First and second stages had operated normally. We recall that cause of previous test failures was defect of first stage. Developers focused their efforts to eliminate design flaws of this missile element after previous unsuccessful test launch performed on July 15, 2009. Not less regrettably than the fact of faulty launch, we have to observe another informational blow-up related with that event. Obviously, reaction of considerable part of analysts is definitely negative. Some of the most eager critics tilt new project of sea-launched missile system developed by Moscow Thermotechnics Institute and require immediate closing up of the "failed program". Moreover, they've already declared the idea to refit Project 955 SSBN Yury Dolgoruky for SLBM RSM-54 Sineva which is being serially produced. That means, however, that Project 955 must be redeveloped fundamentally since Sineva is a distinctly different missile with another dimensions, all-up weight and launch technique; it have nothing in common with R-30. Such project remake would have additional and quite significant impact on defense budget. Reassignment of funds would definitely result in either serious underfinancing or freeze of most other shipbuilding programs. Generally, the government, defense ministry and military industry have three decision options for rearmament of SNF naval component. First, continue developing Bulava and further construction of Project 955 subs. 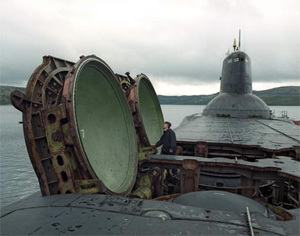 The purpose is to finish launch development tests of R-30, successfully conduct single and multiple missile launches from SSBN Yury Dolgoruky and in tight terms produce first parcel of missiles necessary to arm submarines which are already built (most likely, two – launched Yury Dolgoruky and Alexander Nevsky). 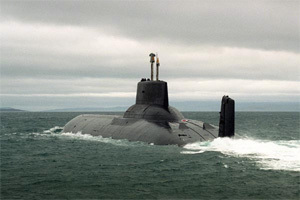 The second option is fundamental redevelopment of the Project 955, refitting laid down subs for Sineva and construction of the rest five subs under renewed project. This knight's move, however, does not cancel the necessity to create a new-generation sea-launch missile system, but in this case the work on it would be relatively quiet. The third option provides shutting down of R-30 project and freezing of Project 955 subs construction. This involves urgent development of new shipborne missile system – obviously, on the basis of project Bark closed up in 1998. Undoubtedly, the third option is the most extensive and expensive. The second one seems to be reasonable, although will result in great financial expenses. In fact, as predicted, the most realistic is the first option with improvement of Bulava. Despite protests, there is nothing fantastic in successful completion of R-30 project. As it was said by Vice Premier Sergei Ivanov in summer, the main point in this process is to bring things to order with companies involved in Bulava production. About 650 factories are engaged in this project; all of them survived in the crisis of 90-ies differently. Mr. Ivanov named process scrap occurred at one of production phases as a primary reason of the missile's faulty launches. Circumstances of test held on Dec 9 seem to prove this version. They had managed to eliminate defects of the first stage, but this time failure happened to the third one. Bulava is the most sophisticated and important defense project which has become an offspring of Russian military industry without backup of huge Soviet experience. Misfortunes of Bulava demonstrate that the industry is far from post-crisis recovery. Another systematic project – creation of fifth-generation fighter – could also be named as a sort of "health index" of military industry. But here we have disappointing news, too. First flight of PAK FA was again postponed to early 2010, although through 2009 both designers and Air Force officials harped that 5-gen fighter would take off not later than in December. Thus, we hold by opinion that nowadays there is no another real option but to continue work on Bulava. Meanwhile, governmental and military leaders should draw simple conclusion from this epopee – monopolization in any area may cause a quite negative impact. Namely, Moscow Thermotechnics Institute has become the only organization concentrated development of intercontinental ballistic missiles for both land and naval components of SNF. Another design organization engaged in SLBM development in Soviet era – Makeev State Missile Center (MSMC) – had been not in the ball game until the last year when a significant change happened. In May 2008 a missile holding was established on the basis of MSMC; it includes OJSC Miass Machinery Plant, OJSC Zlatoust Machinery Plant, OJSC Krasnoyarsk Machinery Plant and OJSC NII Germes research institute. Once this merger is finished (provisionally in 2010), Russia will have integrated structure authorized in development, production and maintenance of sea-based ballistic missile systems and civil space-rocket equipment. Therefore, it will be two large missilery centers; healthy competition will help to avoid mistakes in long-term planning of nuclear-missile weapons development.